Council will have final say on the staff-recommended process at the end of the month. John Tory was elected Mayor in 2014 after promising to outsource garbage collection east of Yonge St. The public works committee has voted to spend up to $500,000 to ask the private sector how much it would charge to pick up garbage in Scarborough, a decision critics say disregards the facts. Council will have final say on the staff-recommended process at the end of the month. “Residents of Toronto want to know . . . that whatever we’re doing we’re trying to find ways to save money, and that includes finding our most cost-efficient ways to pick up garbage,” said committee chair Jaye Robinson. But critics appearing before the committee Wednesday said the process is all about ideology, and union-busting, and that Mayor John Tory and his council allies are pushing ahead with blinders on that prevent them seeing the truth. Tory was elected in 2014 after promising to outsource garbage collection east of Yonge Street. A 2015 staff report concluded no savings could be achieved by contracting out and a blended system is best. Staff reversed course with a new report, citing more up-to-date information. Councillor Paula Fletcher said a city staff report “clearly shows” that in 2014, it was cheaper for city workers to pick up garbage in Scarborough, than in Etobicoke, where trash was handled by the private sector. The cost per home was $142.86 in Etobicoke, compared to $126.89 in Scarborough. “I’m not sure why we’re engaged in this exercise when we have currently really successful, stable situation, with 50 per cent of our waste contracted out and 50 per cent public. While the 2015 figures remain private, a source familiar with the numbers says the circumstances have not changed. 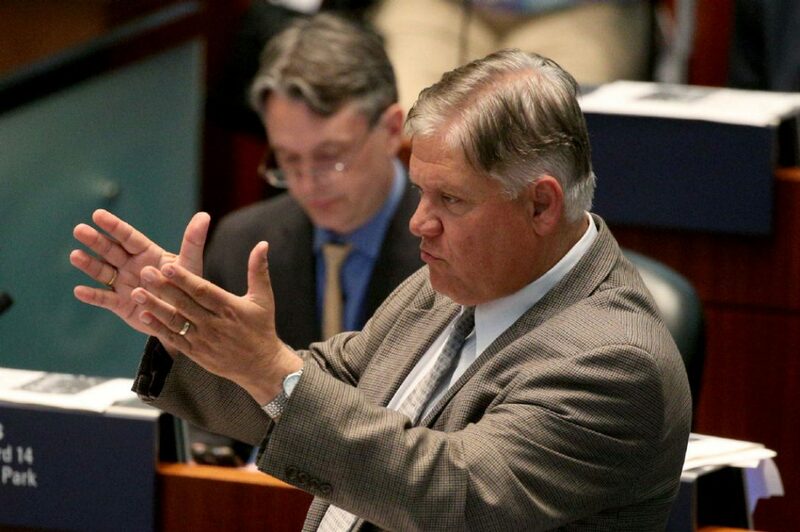 Councillor Jim Karygiannis, who represents Scarborough-Agincourt, asked: “Why are we even thinking of going down the route to privatization” and throwing CUPE Local 416 workers under the bus? There’s disagreement on how many jobs could be lost. Solid waste general manager Jim McKay acknowledged that on the basis of the cost per household, waste collection in Scarborough is cheaper than it is in Etobicoke. “I don’t necessarily dispute the claim, but I would not necessarily agree that that is a direct reflection of the type of services being provided,” he told the committee. Robinson said later while garbage collection is cheaper in Scarborough, the contracts the city signs with private operators are based on tonnage, not the cost per stop. Asked about those numbers, Robinson said staff told her they aren’t available, which prompted Karygiannis, standing nearby, to guffaw. On Wednesday, former Ontario premier Bob Rae was among the deputants appealing to the committee to reject the privatization path. “The experience, globally, with privatization is that there are substantial risks involved to taxpayers if there is no public sector competition to keep everybody honest,” said Rae, who teaches public policy at the University of Toronto. He questioned the fairness of asking CUPE Local 416 to bid on the contract after it made substantial concessions in the four-year contract it negotiated last year. “Now what’s being proposed is, ‘Well let’s open up the contract and let’s have you bid against yourselves and see how that turns out.’ What’s the morality of that?” Rae asked the committee. Councillor Gord Perks clarified that CUPE is not being asked to bid, but to consult with staff who will do the bidding. Emily Alfred, waste campaigner with the Toronto Environmental Alliance, warned contracting out could put in jeopardy the city’s leadership role in waste diversion. “What I’d like to highlight is the very real and sad fact that diversion rates are very different between the districts,” Alfred said. Based on three years of data, waste diversion west of Yonge St., which has been privatized since 2012, is lower than it is east of Yonge. Scarborough has the highest diversion rate in the city, four per cent higher than Etobicoke, Alfred said. “The staff report says this that this difference is minimal, but we disagree,” said Alfred, who added that this is particularly true as Toronto landfill is reaching capacity. Robinson said she is “very committed to diversion,” and wants more information about the discrepancy before council meets at the end of January. Councillors Giorgio Mammoliti and Chin Lee both voted against the staff recommendation.